Last week, Kristina Werner featured a Making Memories White Wood Desktop Organizer that she got for 75% off. She planned on using it as an organizer to hold her “new items” that she wanted to try out, which was SUCH a great idea because I often got new items and end up misplacing them or filing them away in their “places” before I even used them. Of course, that didn’t last long because before I knew it, those things were SOLD OUT at Two Peas. 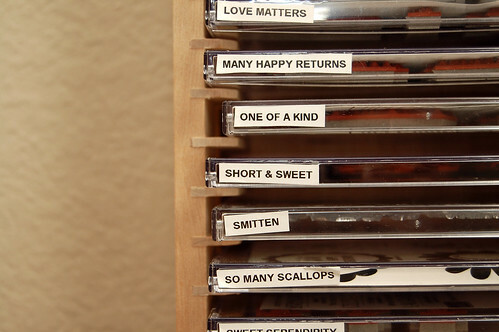 I still loved the idea of having a designated “organizer” for new items that I wanted to use. While I was making my IKEA list, I cam across this MACKIS desktop organizer and became interested when I saw it was 13.5″ wide (PERFECT for 12×12 paper and large sticker packets). It had a wide pocket in the back, a 2nd shorter pocket in the middle, then two corner pockets (great for pens) and a smaller pocket in the middle of the front. Granted it didn’t have the drawers that the Making Memories organizer had, but IKEA does have the FIRA mini chests if you need small drawers. It didn’t have the little metal tag at the side either, but if you’re a scrapper, you probably have a spare one laying around that you could attach using some tools. On my most recent trip to IKEA, I checked one of these out and figured it was perfect for what I needed so I brought it home with me (see picture). If you can grab the Making Memories desktop organizer at a discount, it would be worth it. But if you’re a little on grabbing a bargain like that one, the MACKIS desktop organizer from IKEA works just as well. Operation Space Maximizer Status: Almost Complete, originally uploaded by krisalis903. A little over a year ago, I began the process of transferring all of my stamp sets over to the EZ-Mount system. I’m happy to say that the endeavor is almost complete. I’ve converted almost all of my stamp sets over to this sleek and streamlined system, with the exception of a few sets which I might sell. I bought this wooden CD tower for $10 at IKEA a couple months ago. It came predrilled with holes in the back so it could be mounted to a wall. I’ve got that one almost completely full, now I have to get a second one to accomodate my growing collection. Pretty soon I’ll be growing out of my designated square footage. Whatever will I do? 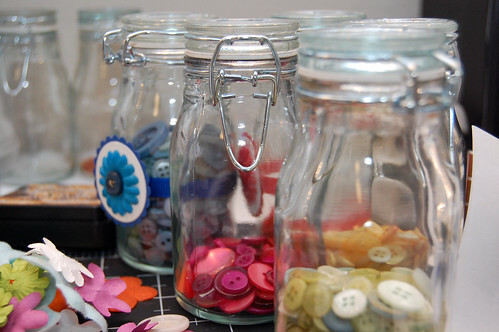 Button Jars, originally uploaded by krisalis903. Chipboard Letter Storage, originally uploaded by krisalis903. Ok, so I have a problem. A very serious problem. I love American Crafts Thickers way too much. 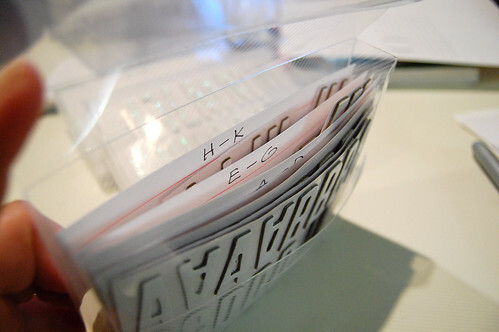 Basically Thickers are adhesive chipboard letters that come in a variety of colors and shapes. I use them quite a bit in a lot of my layouts. As a result, my Thickers collection has become a storage nightmare. Trying to maintain incomplete alphabets while at the same time trying not to waste letters is challenging. I came up with this storage solution to help curb that problem. These are actually Cropper Hopper 4×6 photo storage folders that I picked up at Hobby Lobby for about $5 (4 folders in a set). This solution isn’t just great for Thickers, I think it should work for any chipboard letter storage. 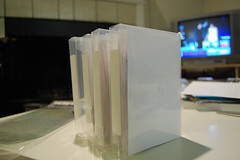 You can see I use 4×6 index cards as dividers to keep all the groups of letters separate. Right now I’m only using this for Thickers, but eventually I plan on adding all my other chipboard letters, organized by alphabet, into these folders. Cropper Hopper also makes another storage solution that would probably work as well and actually has 13 built in dividers. Of course, on the other hand you’re expandability is limited with one of these.